MEXICO CITY - Former president and current presidential candidate Alejandro Toledo shook his country's news media in a press conference when he confessed to discussing UFOs with the international media. "I was interviewed by CNN on a subject that would be considered outlandish, seemingly proper of the realm of science fiction, but it isn't: extraterrestrials." As of the end of this edition, this interview has not been made public, and some have described it as an attention-getter in the midst of the country's political season. 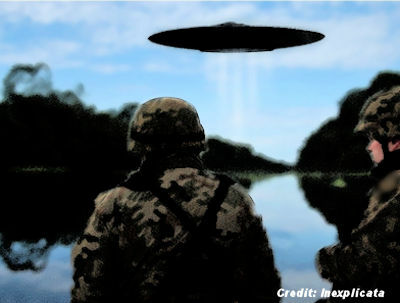 When UFO researchers in Peru were asked about these statements, they admitted to not having more information on the subject, but are certain that a number of UFO sightings took place during the term of President Alberto Fujimori from 1990 to 2000. One of the most memorable ones took place on 7 December 1991 at 21:00 hours, when the presence of a UFO was reported over Laguna de Charo, located in the city of Iquitos in the Peruvian Amazon. The military staff accompanying the president looked on in bemusement. "Fujimori as well as the military watched as an enormous object flew over the lagoon before fleeing the area, passing over the witnesses' heads," according to Julio Chamorro, former commander of the Peruvian Air Force. The retired military man said that following the sighting, Fujimori asked his officers to keep quiet about it, telling them that what they had just seen had never happened. It was nevertheless a source of much conversation within the Peruvian armed forces, and led to the creation of the first phase of OIFA, the Anomalous Aerial Phenomena Research Office attached to the Peruvian Air Force, which has currently been elevated to departmental status with a well-defined structure, featuring both military and civilian advisors. Several Latin American presidents have discussed their sightings. It should be remembered that Mexican presidents Gustavo Díaz Ordaz, Luis Echeverría and Miguel de la Madrid were very aware of the activities of these strange unidentified flying objects. It seems that this secret, kept by the political class, is slowly coming to light, giving way to a new era of general openness.